Just a few short years ago, I remember having a really grim Valentine's Day. There was a huge blizzard, and I was shoveling in the dark, feeling very lonely and cold. As I looked up and down the street at all of the pretty snowflakes, I wondered if I'd ever meet a good-hearted person to love. Truly, it didn't seem likely. Little did I know that just a few short months later I would meet the love of my life. The sun was shining and the air was crisp. We left in the morning and drove north on back country roads. We had a bag of peanuts in the console and I was wearing new shoes. My husband did a few hours of work while I wandered around the local library. On our way home, we stopped at a small town bowling alley and had the most incredible burger either of us has ever eaten. With a side of big, perfectly round, very greasy onion rings. We stopped at a thrift store and bought a Pyrex baking dish that I love, and then ate big plates of pasta at the new wine bar. An ice cream cone for the road. On the way home, little Z road shot-gun, leaning against my husband with his eyes closed, like he always did. It's easy enough, without being predictable or obvious. It builds on a base of iceberg lettuce to which an abundance of blue cheese dressing, bacon, tomatoes, and everything bagel toppings are added. Toss tomatoes with lemon juice and oil in a small bowl; season with salt and pepper. Push the tomatoes slices between the leaves and into any crevices. Top with crispy bacon, dill sprigs, and a few grinds of pepper. I felt the same way before my husband and I got back together. We were married and lost our way, then we found each other again and the world felt like it was such a better place. I love the simple days when we would dine out or go to our favorite restaurants around town. Even a quiet dinner at home. Those are the things that remind you of how good love is. Why celebrate love for just one day when you get the chance to feel it every single day, right? I fell like this salad will make me happy! Life is full of surprises, indeed. I’m glad you finally have your husband and that you’re living a more love-filled and colorful life because of him. Those little moments make a huge impact in our lives and it’s definitely better than just celebrating Valentine’s day. I’m pretty sure I’m going to enjoy this salad especially when Spring rolls in. The dressing is like heaven! 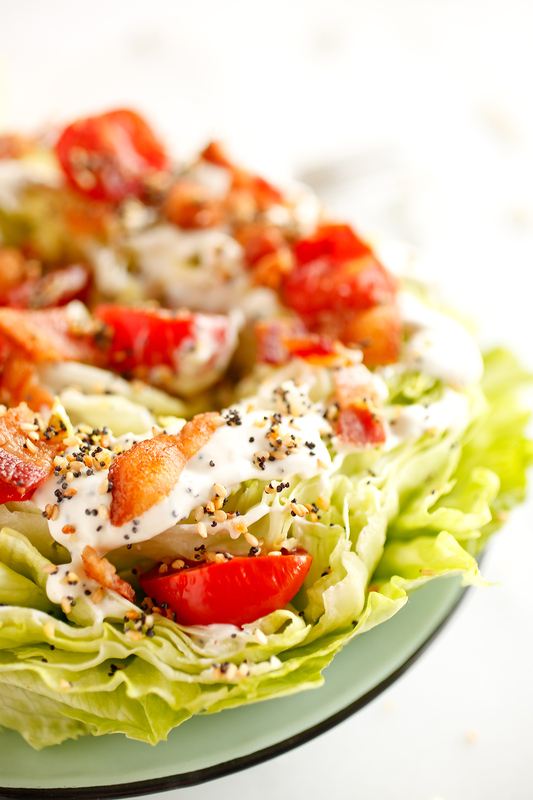 Feb.14 is just another day but I do love a good wedge salad! Cheers! Wish more people in my family enjoy blue cheese dressing. Seems like little goes a long way since I am the only one who eats it. Love freshly made on top of my salad. I’m all for a quiet Valentine’s Day. We don’t really do much for it, and we still have kids in the house. We do pass out candy, but that’s about it. This looks like a fantastic salad. I’d have to do another dressing though, I never got a taste for blue cheese. But I love everything in the salad! You have such vivid memories of Valentine’s Days gone-by. Love the details of the foods and feelings. This salad looks so good from these pictures! I’m going to have to try out this recipe when I have a chance. Thumbs up on a great post! I really loved your approach towards Valentine’s Day. The pics of this salad looks amazing but, unfortunately I won’t eat bacon. Can you please suggest an alternative to it. I like the idea that Valentine’s Day is about love and not just romantic love. I was fascinated reading the part about your thoughts when you were shoveling snow on a bleak winter day. Indeed one never knows what awaits us round the bend in time. The sald looks lovely and as you suggested serving it chilled ensures the magic is intact. I like that when your kids were little, you didn’t devote Valentine’s Day to only romantic love. It’s important to embrace all the kinds of love we have in our lives. I could definitely go for wine or some greasy onion rings too! I feel the same way though, February Just isn’t for me. Love this recipe and the pics! I get the everything bagel topping from Trader Joe’s and it is amazing! Great writing as always. I agree with you on Valentine’s Day. I don’t recall if we’ve ever went out for dinner in 8 years! This year we stayed at home while I attempted to make a nicer-than-usual weekday meal of baby rack of lamb for the first time. However, for dessert, we indulged in some whoppie pies from Costco because baking is definitely not my strong suit! I think Valentine’s Day is what you make it – it can be great if you keep it low key. This year we went out for dinner with a friend (whose fiance is out of town). We took her to a new Italian restaurant and ate our weight in pasta and had some really terrific wine. I also baked heart shaped chocolate chip cookies for the office. I love your little stories – those sound like great days! And about that salad – how could it NOT be delicious??? February doesn’t excite me either. Is dreary and January has come to encourage health and then bam…candy everywhere. I don’t like that. I agree with making Valentine’s day a day for loving anyone, not just romantic love. This year, my wife and I did pretty much our favorite thing – we stayed home and cooked together. I made calzones and a really decadent fondue. She sliced fruit and wielded the cookie cutters because, like you, she loves heart shaped sugar cookies (with extra pink frosting). It wasn’t at all in the healthy category, but there’s something to be said for a little indulgence every now and again. I can’t think of a better way to celebrate the day. We do little gifts for the kids and each other on Valentine’s day. But it has never been something we got excited about. That salad on the other hand looks like something I could get excited about. I feel the same way about Valentine’s Day now that I’m married. I barely remember any of our Valentine dates but there are so many other times together that I’ll never forget. Like you, lots of our favorite memories are tied to food (or drinks)! I love blue cheese, as in I will eat chunks of it in the container. It’s yummy! I’d love to have this salad drizzled in that homemade blue cheese goodness. My favorite way to celebrate Valentine’s Day is a trip to our corner deli for something yummy. Then, an evening hanging out with my guy watching a movie and having a no fuss meal (he loves not being on dish duty). But chocolate for dessert is a must! I feel your pain on the dreariness of Iowa, I’m from Indiana so I get that same Midwest cold. Regarding the recipe, my motto used to be blue cheese makes every meal better so I’m sure this one is delicious. I just love how you tie stories and food – so important, like narrative art really. Thank you for that. My partner and I sort of boycott V day- kind of a Hallmark holiday to me in many ways…will try that salad, however! 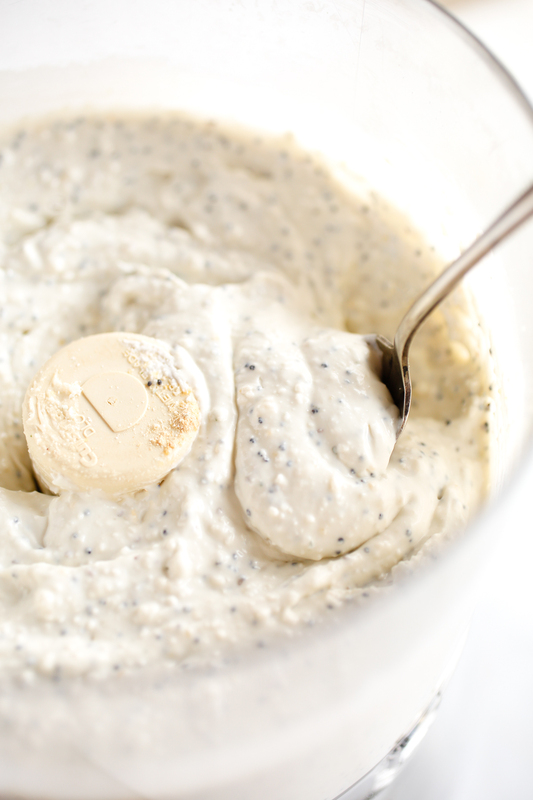 Hmm, are poppy seeds a typical ingredient in bleu cheese dressing? I am constantly learning things on this blog! I didn’t realize that you are in Iowa! That is where my sister lives. It is always so cold! Our Valentine’s day is the same every day since we started our family, which means it is a Family Day. No complaints, because I know there will come a time that we will be empty nesters and we want to spend as much time together while we can. I am happy that you found the love of your life. I can so relate to that too. My husband is a blessing from heaven. Oh, this is so SWEET. I love the way you write about your love and your life. It’s so simple but also so emotional. Your husband sounds like mine the way he plans little fun things for us to do. This Valentine’s Day the budget was a little tight so I made a roast and a pretty tasty chocolate tart. We are not married yet but have been together nearly eight years. We celebrate our life together every day. We are blessed to be together. On Valentines day we stay in and cook up a “romantic” feast for two. Thank you for your blog post. Really, thank you! Awesome. A wedge salad is one of my faves. I got something like this once at a steakhouse with blue cheese dressing and Ill never forget it. Somehow I never made my own version at home but now I want to! I agree with how February feels like. I think as we age our perception of things really changes especially when you have kids. 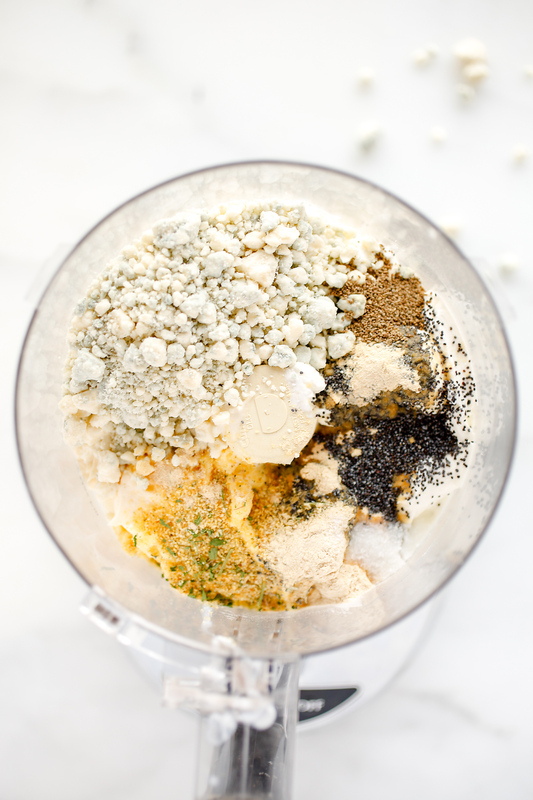 Love your blog, love your photos, love your recipes and all of the comments. One of the highlights of my day..thanks so much! Two years ago, my best friend brought me a batch of your granola to get me through the first days of breastfeeding after my daughter was born. This winter, I finally had some extra time to dig through the archives. I have been systematically reading all of your lovely stories and making the recipes for my family. My husband declares them delicious. Thanks for sharing your kitchen and part of the world with us. I loved your post, it took me right to the moment, four years ago today I was doing the same thing. Walking through the freezing cold to meet friends at a little bar in Frankfurt, Germany. Little did I know, I would sit right next to the man who would become my husband and my soul. Such a lovely story! This looks like a great salad too I’ve never tried blue cheese before but it doesn’t mean I won’t. I think I’d love to try this and know my two salad lovin girls would love it too! Your blog is so calming. I want to sit and drink tea while reading. I just started blogging and a friend said, “Look at Veggies By Candlelight, it’s fabulous.” So, I did, now there are eight million recipes I must try. Thanks for a great example of what a blog can be. It`s been so cold in the Uk as well. I am hoping that Spring comes this year. Meanwhile, I already put my coats aside thinking I can influence the weather. They announced heavy snow on Wednesday so I don`t think I am winning. Nevermind. I love a recipe with a great story, it makes me want to make it even more! Really! I am now heading to my desk to add blue cheese to the market list this week- I am so making this. I’ve been making your recipes like crazy around here. Those ginger/apricot/chocolate cookies? Oh my. Just wonderful. Tonight I made the blue cheese dressing and it was awesome, too. Thanks, Ali! That dressing sounds utterly divine! Great way to jazz a salad up, for sure! I’ll be trying this soon! The food really look so delicious. We hardly have blue cheese over here but I did try in the hotel before. I can always replace it with other type of cheese. Oh Ali!There you go again with your yummy recipes… Mel is so right, we really love your millions of recipes for sure . And this one is no exception, it really looks delicious and I’m sure it is. Lettuce is such a veggie…and a trip with hubby eating yummy veggies sound so romantic…mind you, I wouldn’t have regretted eating the entire burger too! I realised this year I don’t like January or February. I think thats something I’ve gathered over the year. I need sunshine and warmth! I also totally get what you mean about having heartfelt moments daily rather than a huge grand gesture on one appointed day! This salad looks absolutely amazing, I would love to try it! We are together many years and don’t really celebrate Valentine’s Day the same way any more either. I will make a nice dinner of an old favorite or something I think he’ll enjoy as much, it works for us. Ahh I love this and I totally agree, my favourite valentines day have been cosy meals in or a burger out, I’d rather do something we are comfortable with and know we’ll relax and enjoy than a fancy meal in a stuffy restaurant. This looks like a delicious salad, I’m all about the cheese! I never liked February because it’s a tough weather month here in Boston, but in 2017 I lost my mom in February, so now I hate it even more. 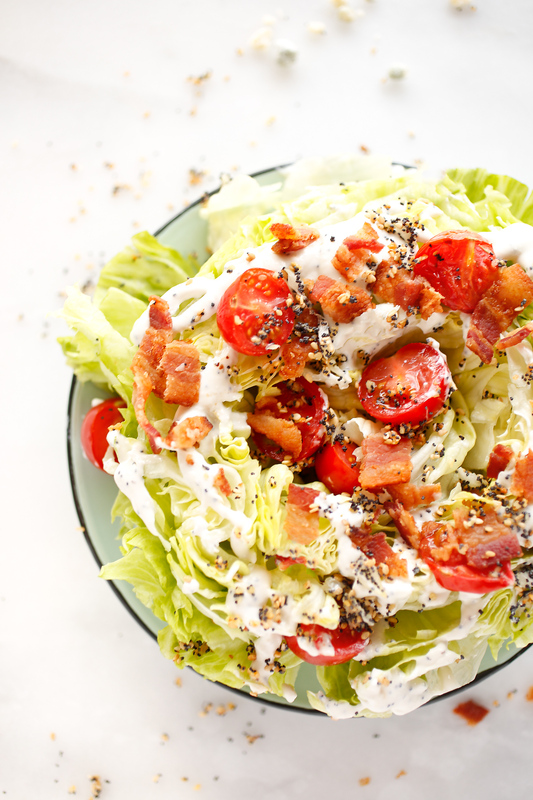 Making a wedge salad takes no time at all and is so good and healthier for everyone. Different toppings for everyone to choose from. Some of us like blue cheese some don’t so we always have a variety of dressings for everyone to choose. From experiencing a grim Valentine’s Day to meeting the love of your life a short while later really does prove that we never know what’s around the corner! 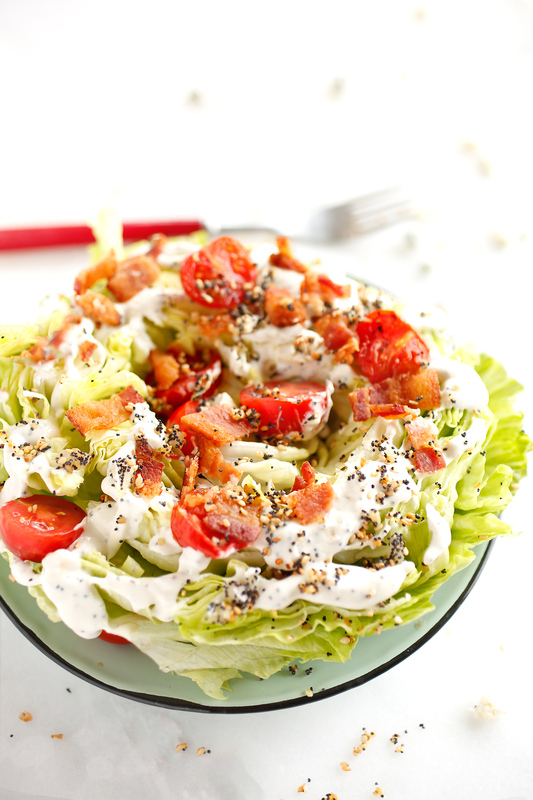 I love salads and your Wedge Salad with Blue Cheese Dressing looks healthy and absolutely delicious! I enjoyed reading your memories of love throughout the years. It sounds like you really enjoy a simplistic Valentines. The salad looks incredible too, very healthy and delicious. Love this. Thank-you so much. I was having such an awful day and instead, you (and all of the lovely comments) really cheered me up! I’m a writer in Sydney, and I wrote an article for a magazine, telling people what to do for fun February (and Valentine’s) dates… then ironically, I was home alone eating ice cream. Didn’t feel too hot… but it’s okay! There will be better ones!! I live in France and didn’t do anything special for Valentine’s Day, given that I recently moved here. Instead, I cooked myself chicken and dumplings and ate it on the sofa while watching a movie. The bummer thing for me is (I think) my soulmate also happens to be my flatmate and because we’re flatmates, it’s a no-go. Le sigh. My wife and I have been together for twelve years now and this year was the first time we officially celebrated. We decided it was high time we celebrated the life we just happened to create. So excited to try the salad! I have never made blue cheese before. I totally can’t wait to make this! 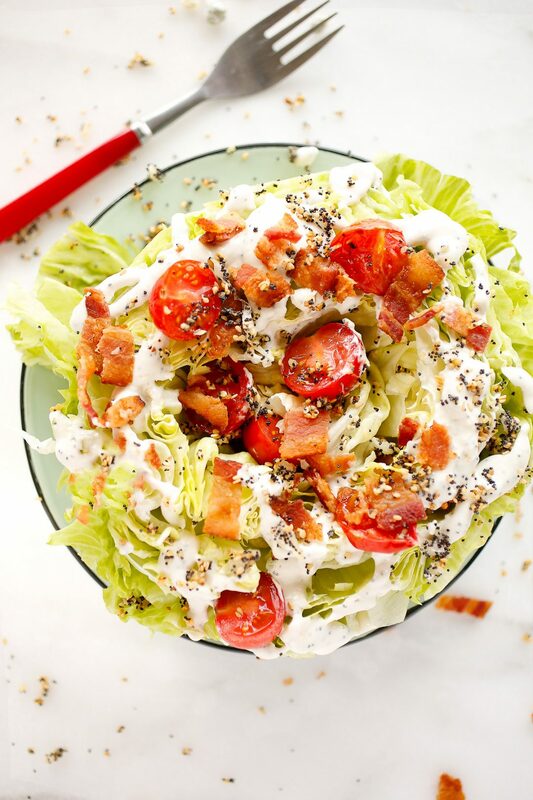 First off, I love wedge salads and this one looks amazing! Second, I adored reading about some of your favorite memories. They really made me reflect on similar times in my past. It’s the small moments, the things that happen unexpectedly, that tend to create the most fond memories!!! Thanks for sharing those! You never know. I guess it’s kinda like the iceberg wedge, the simplest of things, but you never know. 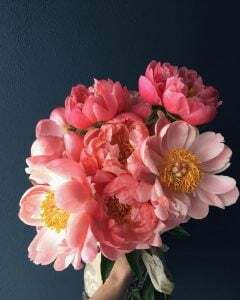 My husband and I have been married for over 20 years and I actually prefer that he doesn’t get all mushy on Valentine’s Day. I guess when love was new it was different but now, it’s simple things like going to a movie matinee while the kids are at school or sneaking out for a shake or going to the gym together. Just the simple, everyday things. I totally agree about Valentine’s Day! It’s nice and all, but a bit unnecessary. The recipe looks and sounds delicious! Do you think Greek yogurt would be an ok sub for the mayo for us calorie counters? I love wedge salad! It’s Springtime (almost anyway) and I am in the mood for fresh light refreshing food! Blue cheese is my favorite and anything with fresh ripe tomatoes is a plus! This looks so amazing, your site has become my goto for food/cooking inspiration! Love the photos! This looks tangy and creamy and delicious! I love how you combine a great recipe with a great story. We cant find blue cheese easily in Singapore but I would love to try making it too no matter what. Look so delicious and healthy. Great for all ages. I love Valentine’s Day because it just so happens to be my dogs birthday! That Wedge Salad with Blue Cheese Dressing sure does look delicious. I love wedge salads. for me, every day is a Valentine’s day. My husband and I take turns to surprise each other with beautiful candle lit dinner. This looks like it is from a restaurant! I love when they have wedge salads on the menu. I get them every time I see them! I am too lazy (or scared?) to make them myself at home! Maybe I should try this out though!! I really enjoyed reading your stories! You give me hope that love may just be around the corner for me. I’m all about the everyday affection AND take me out for Valentine’s Day too!I’m a hopeless romantic and always hold on to the thought that Mr. Right is just around the corner! The February has been challenging for me, too. I usually lead an international Wellness Retreat to somewhere exotic and warm, but we decided to skip this year. I am desperately missing the beach! Sounds like you had a great low key Valentine’s this year. Wedge salads are in my top 3 favorites! I’ve never been a blue cheese fan for some reason. First of all this recipe looks amazing. I love a good blue cheese wedge salad. 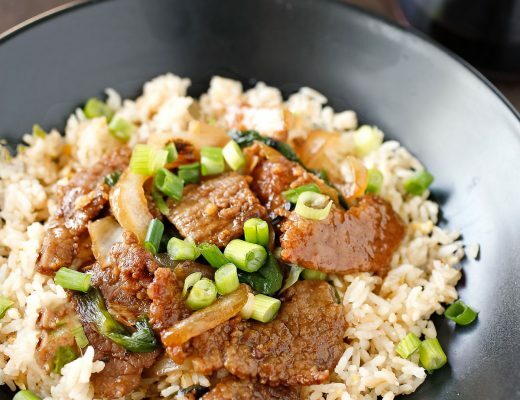 It is so good and perfect for lunch or dinner. WE are not big on the Valentine’s stuff either – we celebrate with our kids by getting a heart shaped pizza! ha! I am not big on the commercialization either. First off, the salad looks amazing! And your photos are stunning! Now this salad looks so yummy and refreshing! I need to try this ASAP!! I enjoyed reading the memorable episodes you had with your hubby and observing that these experiences were heightened with food. I too would love to reexperience the milestones in my life. The photos I have captured makes them vivid in my mind. I feel the exact same about Valentine’s Day, why should we feel pressured into doing something special when we should be making every day special. I’m like you and remember all the silly little things, a cup of tea in a local cafe on a crisp Sunday morning, him making me breakfast in bed when I’m feeling awful, those little things mean the world to me. I love the fact that you show the quiet moment can be more or just as special as the big ones. My oldest son, at 17, has a new girlfriend. It seems with teens that everything has to be big. They have to “out-do” their friends. We now have Prom-posals where the question is spell out in pepperoni on a pizza or something else just as crazy. I’m a sucker for a yummy salad. This one looks delicious. We had a family style Valentine’s Day. Once a week the four of us cook dinner together. We turned up the music and danced around while we cooked together. I decorated the table and we exchanged cards. No gifts, but lots of laughs and a full heart. I like gifts, don’t get me wrong. I absolutely LOVE wedge salads and now you have me wanting this salad ASAP! I have never had homemade bleu cheese dressing before. It looks easy to make and I am sure 1000 times better than the bottled up. I am trying it for sure! I have noticed over the years that my husband and I have gotten into certain routines that I never really thought about. He always tries to make our anniversary, valentines, and birthdays special but I never make a big deal out of any of it. I just don’t have it in me but I do enjoy celebrating whatever he has cooked up. I especially like spending time together without anyone else on these dayss and enjoying a good dish like this one! 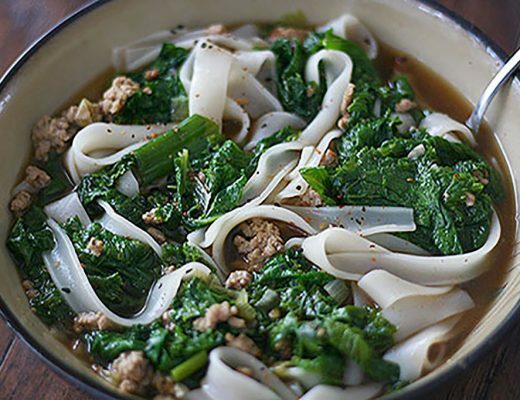 I love everything about this recipe, the whole thing from start to end looks incredibly fresh and tasty. It is quite simple and really you don’t need much but I would go ahead and add cucumber for extra crunch. This February has been a manic one, with work and personal life, it is just go go go. I am hoping that March will be a lot calmer but very much doubt it, but that is life hey! I spent my Valentine’s Day with my best friends and my girl gang. Seems a lot of fun with friends and ate to the fullest. I quite appreciate your take on the Valentine’s Day and I feel its very courageous of you to do the tickle thing in the restaurant. I would never even think of it. Finally, the salad looks so healthy and delicious. Gotta try it before I can say more about it. I had my first wedge salad a few years ago and I’ve been obsessed ever since. You’ve got my absolute favourite here. I love blue cheese and bacon so much! I have very mixed feelings about Valentine’s Day, as most of the years was just a day. But it’s been 2 years now since I am together with my one and only on this day, and it’s starting to change. I do agree that love should be celebrated every day, but it’s so nice when you get surprised and spoiled all of a sudden. I have a gratitude journal too! And I love that you wrote a little note to yourself, that made me smile. It’s been grey and dreary here in the UK too and lots of snow. Urgh. The dressing sounds delicious too, I must invest in a processor! We couldn’t care less about Valentine’s day, and still, here we are, still loving each other for the past 20 years. We still have children at home, but they don’t even know Valentine’s day is a thing! I love how you made Valentine’s Day for your kids a celebration of all types of love. I think there isn’t enough emphasis. I love a good lettuce salad, it’s so crisp it just adds a lightness to main dish. And if blue cheese dressing has gone out of style than I’m bringing it back. IT’s legit still my fav dressing that along with lemon and olive oil. Have you ever slightly grilled the lettuce? I just had a slightly grilled/charred wedge salad the other day and it definitely added a dimension to the dish. 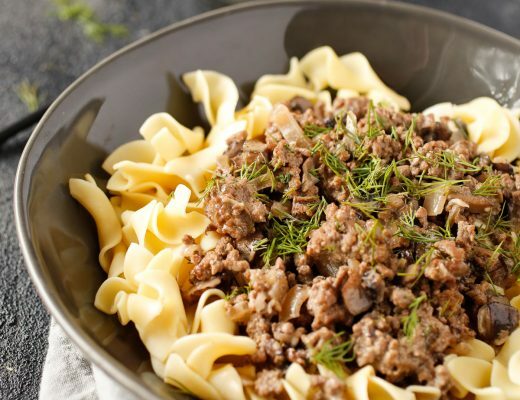 Great writing, recipe looks good as well I’ll definitely give it a try and look at some other posts you have as well, this was a really good read! I agree with you! Having a little boy on the way makes me really want to teach him these values about days like Valentine’s Day! Funny you said that about the iceberg lettuce because in my house that’s all we like and use for salads in general. What an amazing dish, definitely saving it for the “not pregnant” days (as at the moment I cannot eat blue cheese. Any great mom-to-be friendly cheese alternatives? I spent my Valentine’s night at parent/teacher conferences…badly timed I must say. Then pizza and a girly film with my mum. So a little bit of bad with the good! 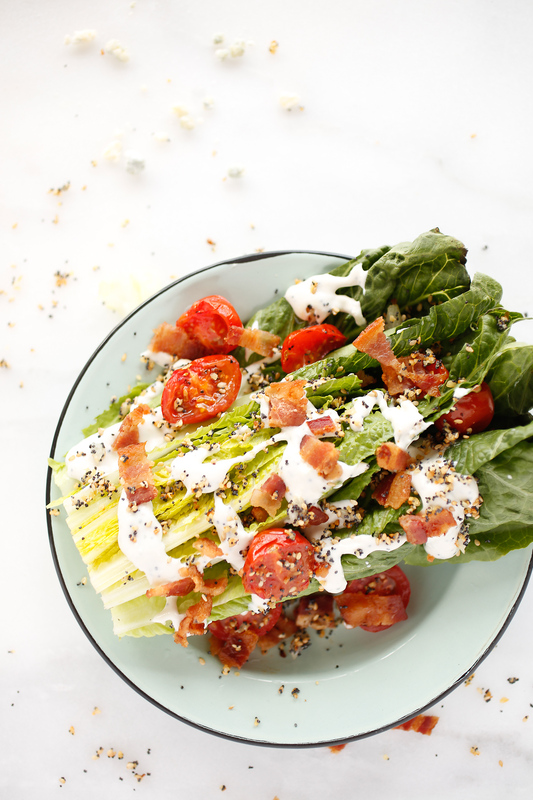 This Wedge Salad is looking so tempting. I can’t wait to have it. This wedge salad looked delicious I really love the sound of the blue cheese sauce. I love blue cheese! This salad looks delicious. I myself don’t celebrate valentine’s day but I’m lucky enough to have a partner who shows how much he loves me every day. What some lovely memories, I have to admit for me Valentine’s is just another day, nothing special about it – love should be showed across the year. I hope that one day I am as fortunate as you and your partner are to find true meaningful love. What better way to cherish that love that with this blue cheese delight. I can’t wait to make this. Love your posts, Ali. Your writing and storing telling always gets me. Every time.. This looks so much tastier than the salads I am used to eating! I love blue cheese, so I think this recipe would go down well with me. Oh I love blue cheese, and the salad looks delicious! Your approach to Valenine’s day I can 100% relate to. All those happy moments together make much sweeter memories than a bouquet of flowers and a box of chocolate. Valentine’s Day is always so different every single year for us too! It’s awesome when there are vivid memories of each one even if it’s something that went south. This salad looks like it would be amazing & it has one of my favorite dressings. I must confess I don’t usually make salads, but would happily give your recipe a go as it looks delicious! I definitely understand what you mean about Valentine’s Day and romance. Then again, I’m now the guy staring down the long street with the snow falling (metaphorically speaking as I’m in California). And who knows whether that person will enter my life in a meaningful way. Love does come whether I’m single or married, which I know to be true. Although I do miss the aspects of waking up to the person I’m in love with and sharing a life together. You are definitely blessed. I’m also with you on the idea of romance though. If we require a holiday to be romantic, somehow I feel like we have lost the idea of romance. To me romance comes in those unexpected moments of beauty between you and your partner. As for this recipe, I’m salivating at the thought. And I will have to try this out because I never would have thought to add hot sauce to a blue cheese recipe! Mmmmm!!! 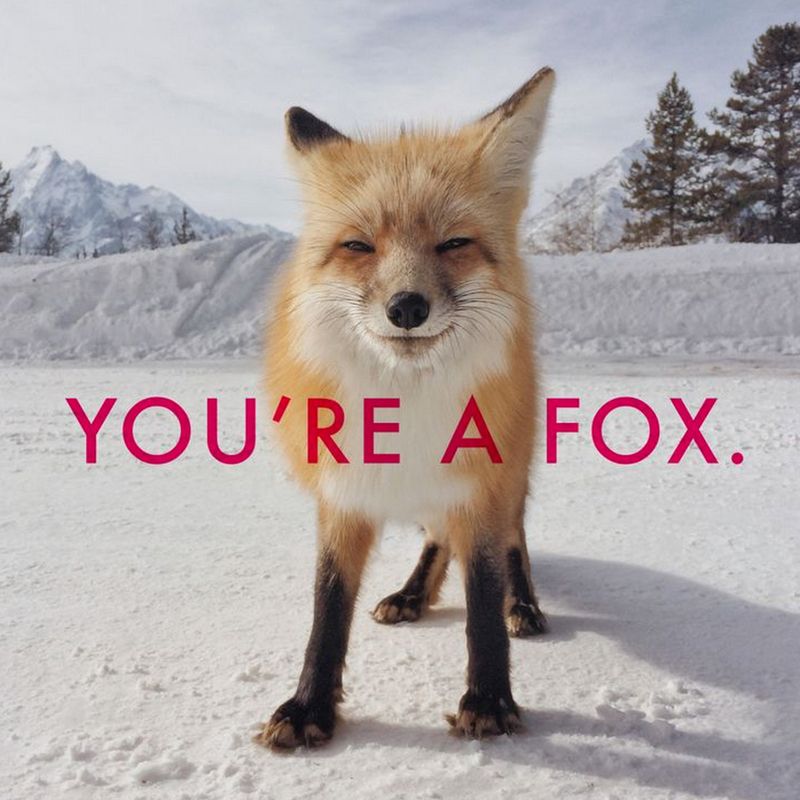 I just discovered your site and am….elated! I love cookie for my roommates because it makes everyone so happy and I told them all they would weight 20 pounds more by the end of this semester. I’m so happy I found this recipe! A cafe in the town I used to live in used to have a wedge salad on the menu that I couldn’t resist. Thanks for all the great recipes on this site, can’t wait to try them!! I absolutely agree with your philosophy that Valentine’s day should not only be about romantic love but to celebrate those in our lives we have ever loved. Being single on that day is the pits completely but life does go on and for me, it’s just another day. I love the iceberg salad, by the way. I cannot even tell you how many of your recipes I have saved and plan on trying. You literally don’t post bad articles! As always I am amazed by the beautiful photos that make me even more tempted to try them. I also must add that I love that you incorporate stories with your recipe posts rather than just pictures and a recipe. It makes it so special!